Puguang Temple or Puguang Chan Temple, is a Buddhist temple located in Yongding District of Zhangjiajie, Hunan, China. According to Hunan Yongding Records, the temple was first built by a military official Yong Jian in 1413, under the Ming dynasty (1368–1644). A legend has it that one day Yong Jian saw A flock of white goats on the hillside. He rode his horse to chase the goats, but the gaots got into the earth. Yong Jian thought it was strange and ordered his soldiers to dig the earth. The soldiers could not find anything, but a pile of gleaming silver. He reported to the emperor for his discovery. The emperor was happy and issue an imperial edict to Yong Jian to build a temple by using the local materials at the place where the silver was found. The emperor named it Puguang Temple. Soon afterwards the land nearby the temple were also known as Fengshui treasured place (a valuable land with a good geomantic omen). Therefore, the local officials and despotic gentries built a Town God's Temple, a Temple of Confucius and the Gaoliang Academy there. 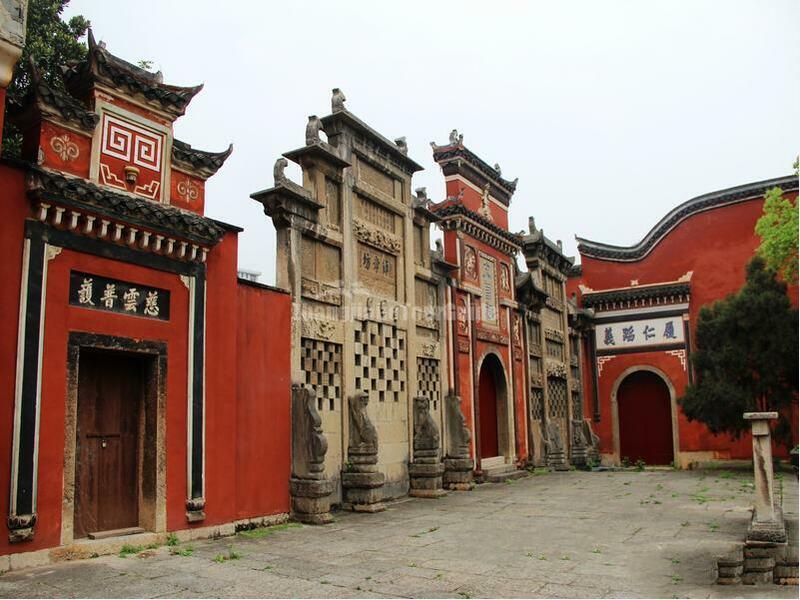 All the buildings including Puguang Temple were called Bai Yang Gu Cha (White Goat Ancient Temple). Being an important part of the architectural complex of Bai Yang Gu Cha, Puguang Temple is lucky. 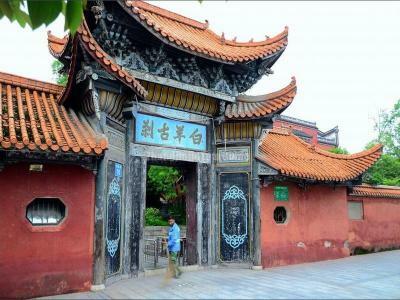 It was not destroyed like other buidings of Bai Yang Gu Cha in history. In 1733, in the reign of Yongzheng Emperor in the Qing dynasty (1644–1911), a local official named Shi Cheng renovated and refurbished the temple. Puguang Temple still looks beautiful today. The extant structure is based on the Ming and Qing dynasties building principles and retains the traditional architectural style. 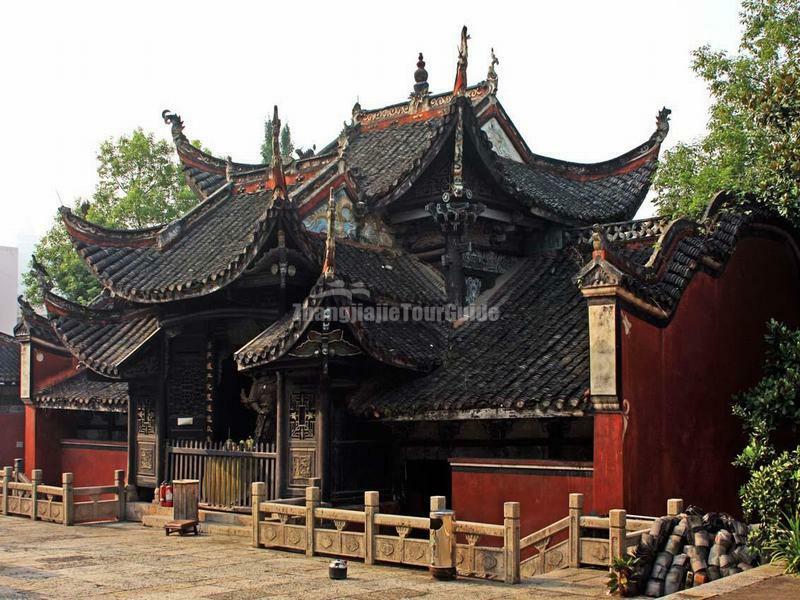 The complex include Shanmen, Mahavira Hall, Hall of Four Heavenly Kings, Hall of Guanyin, Bell tower, Drum tower, Hall of Arhats, Dharma Hall, Dining Room, etc. Statues of Heng and Ha sitting on the seats before both sides of the Shanmen. Under the eaves is a plaque with the Chinese characters "Mahavira Hall" written by former Venerable Master of the Buddhist Association of China Zhao Puchu. It went through more than 10 rebuilds. The latest maintenance was in 1989. The Mahavira Hall enshrining the statues of Guanyin, Manjushri and Samantabhadra. The Hall of Arhats houses statues of life-like Eighteen Arhats with different looks and manners. A statue of Guanyin is enshrined in the Hall of Guanyin.